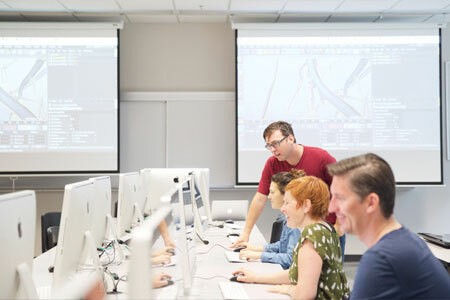 The Creative and Critical Studies building houses gallery and studio spaces for students enrolled in courses in the BFA Visual Arts, Media Studies, and Theatre courses. 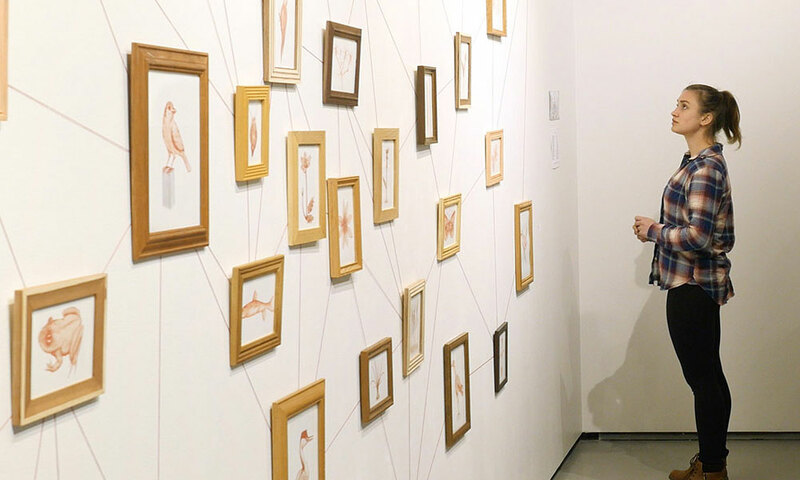 The FINA Gallery, in the foyer of the Creative and Critical Studies Building, hosts exhibitions throughout the year—some by visiting arts, some by faculty members, and many by BFA and MFA students. 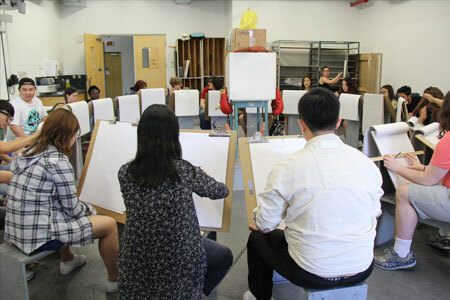 The Fine Arts studios are used as classroom as well as working spaces for students taking classes in visual arts, media studies and theatre. 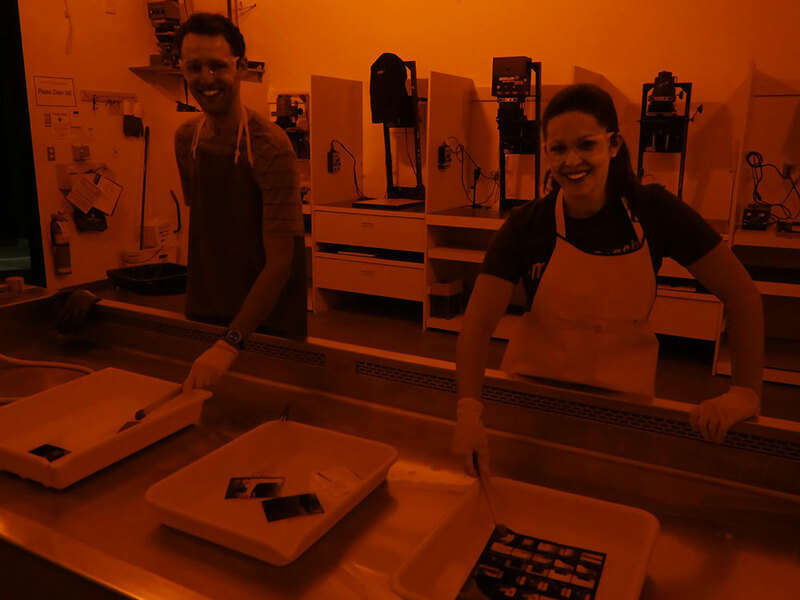 The darkroom (CCS 229) is an ideal space for processing black and white resin-coated or fibre-based prints, as well as working with pinhole photography and alternative processes such as cyanotype. A variety of enlargers allow students to make prints from 35mm, medium format, and large format negatives. Students come together under the amber glow of the safelight in this traditional darkroom environment. The darkroom is a social space where students can share ideas as they develop. CCS 221 and 222 are diverse drawing spaces with white exhibition walls and a variety of different drawing furniture and equipment. The studios are often arranged to accommodate live models or still-life objects and structures. 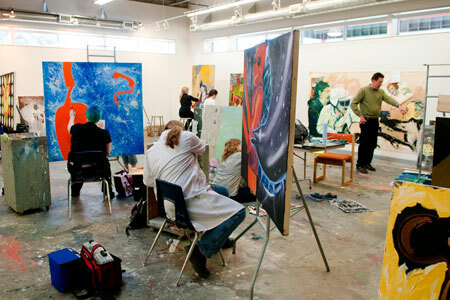 Students taking Visual Arts courses have 24 hour access to these studios to work on class projects throughout the year. This multi use room (CCS 227) is available to students and faculty to use for video work, photography shoots, talks, demonstrations, or other art related needs. Lights, interchangeable paper back drops (black, white and blue backdrops), a green screen for video keying and a Mackie X-Bus midi controller with Blue Sky 5.1 surround system are part of the space. The green room can be reserved through the creative studies booking system. There are two computer labs (CCS 141 and SCI 128) that are used as a teaching space and works space for students. The computers (in both CCS 141 and SCI 128) and flatbed scanners in (CCS 141) are also available for students to use outside of class time to work on projects. The computers have Adobe, Final Cut and Microsoft software. CCS 141 also houses a hardware rack for analogue to digital conversion. The 1800 sqft metal shop also doubles as a sculpture studio and is well equipped with a combination of traditional and CNC machinery. This includes a plasma cutter, oxy-acetylene equipment, MIG and TIG welders, a CNC mill, laser cutter and 3D printer. This flexible working space provides opportunities to work in a variety of materials and also houses a gallery space for critical evaluations of student work. The shop is open weekdays from 9am to 4:15pm and students are required to work with a buddy when using the power tools and welding equipment. 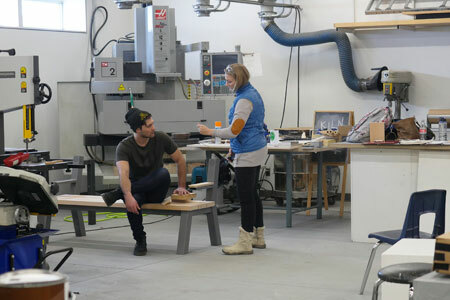 The metal shop offers a dynamic working environment and provides complimentary facilities to the wood shop that is situated across the corridor. The painting studios (223 and 224) are a combined 2400 sqft and come fully equipped with easels, tables, rolling carts and chemical storage. These large spaces with white exhibition walls and upright storage racks are often bustling with diverse student painters who are able custom build their painting supports in the CCS Wood Shop. The printmaking studio (CCS 127) is very versatile. We teach a variety of print media – everything from etching to stone lithography, relief printing (linocut, woodcut, letter press and monotype printing) and a unique form of highly detailed screen printing. We stress traditional printmaking methods but we also work with the most up-to-date photographic applications as well. 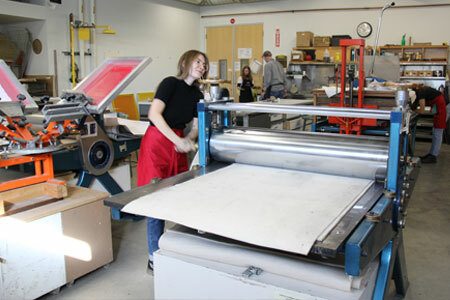 Because of the specific equipment needs of most printmaking media the 24–hour, seven days a week access makes the printmaking studio a vibrant and active place to work. This 1300 sqft studio houses several tables, benches and shelving for an ample amount of workspace and storage. 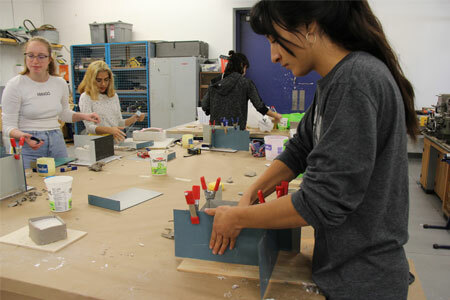 CCS 123 is used by students in their 3-Dimensional Art Practices class, where 3-D sculptures are created using a variety of materials such as plaster, wood, metal, paper or found objects. 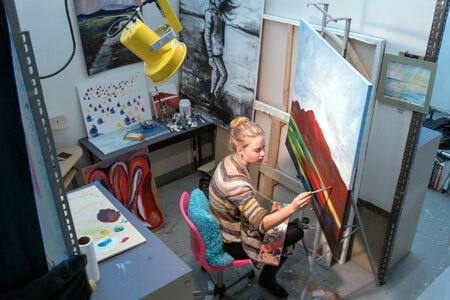 The 4th year studios are located on the 2nd floor of the CCS building and are divided into individual studio spaces where BFA Visual Arts students in their final year of study have a dedicated space to work on self-directed projects. 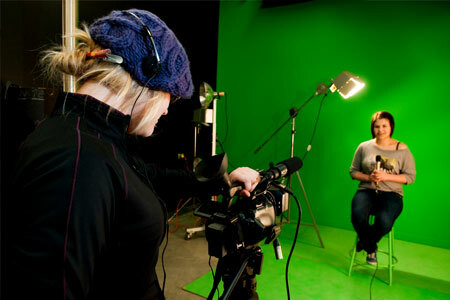 CCS 144 is the home studio for Theatre courses, and is available 24/7 outside of scheduled class times. It is a large open space with a sprung dance floor and is equipped with a digital projector and sound system. The University Theatre (ADM 026) is a 200 seat theatre complete with state of the art digital lighting and sound equipment. 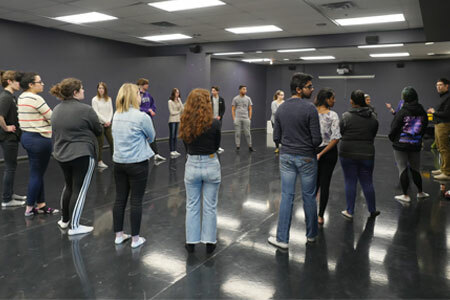 Students registered in Theatre courses have 24/7 access to the theatre outside of scheduled class times for class projects. The Wood Shop (CCS 124) is fully equipped with all of your standard woodworking tools and machinery. After completing the mandatory safety training (VISA 090), Creative Studies students have access to all of the equipment – from traditional tools such as hand planes and carving gouges to larger equipment like table saws, mitre saws, band saws and a thickness planer. The shop is open weekdays from 9am to 4:15pm and students are required to work with a buddy when using the power tools. With plenty of work benches and space, our shop is often full of energetic art-makers building anything from canvas stretchers to installation sculptures. UBC designated a house on the campus grounds for MFA studio space, fondly known at Platypus House in the Department of Creative Studies, but officially known as University House – was renovated to create six Visual Arts studios, a shared studio for Creative Writing students, and shared space for all FCCS Graduate Students. It is located past the pond in the southeast corner of campus. What started out as a Panabode home in the 1960s has now been reinvented as a collection of studio and performance spaces for graduate students in the Fine Arts. These include one-room studios for visual artists, a large living room/performance space for small gatherings, a large workshop space and a separate studio with a dance floor for performing artists. This house has a kitchen, a large storage area in a garage, and a great deck and yard for socializing. The “living room” in the house can be used for performances, meetings, readings, or other related events. UBC installed a portable next to this house that was designated a Graduate Performance Studio space. MFA performance students can this large room use 24/7 without needing to worry about classes booking the space. Visit our FCCS Art blog showcasing some of our current student and alumni works. 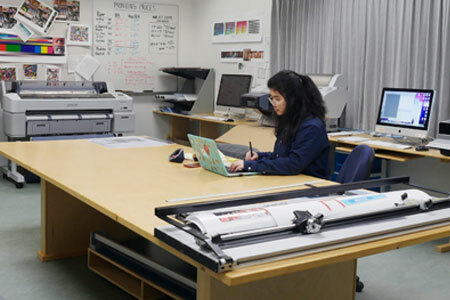 The Department of Creative Studies offers on site digital printing services to accommodate student project needs, providing creative, cost effective ways to print. The printing services are conveniently located in what is known as the Spark Lab, in CCS 151. This service provides quality, full colour digital printing ideal for wide format printing (up to 60” wide on some materials). There are a variety of paper options to choose from including canvas and photo-tex. The services are delivered by selected students who are hired and trained to help. The turnaround time for prints is usually 2-3 days depending on schedules. 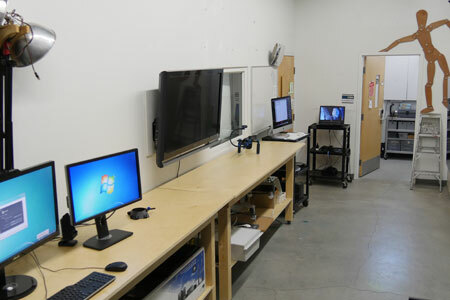 Students and faculty can come to borrow equipment (CS Bookings) for their projects or get technical assistance. Various types of cameras (video, digital, film), lights, audio equipment including microphones, speakers, sound systems, recording devices, and other technology is available here. This space is ideally located between the Green Room (CCS 227) and the Dark Room. The Centre is open from 8:30 – 4:00 pm Monday through Thursday, and 1:00 – 4:00 pm on Fridays. The Department of Creative Studies offers the purchase of some art materials for specific courses. You must contact your instructor or technician for availability and pricing of materials before purchasing. Please check with your instructor or technician for pricing information. Payment for these items can be made online, or in cash to Simmone Kessler in CCS 152 (invoice must be presented). We have two Canadian Foundation for Innovation funded research Centres in the Faculty along with two research Labs with opportunities for students to work with faculty and fellow students on a variety of research projects. The AMP Lab houses projects that engage in the work of the humanities–adding value to cultural artifacts through interpretation and analysis–in a digital context. Broadly, all AMP Lab projects investigate code as a sustainable medium for representing cultural history. The stakes are high, as the development of sustainable, robust humanist data shapes what both scholars and the general public can know about digitized cultural history. The Centre for Culture and Technology (CCT) was established in 2011 by FCCS professors Aleksandra Dulic and Stephen Foster to promote research that brings together art and science to develop a critical awareness of the dynamic relationship between culture and technology. As a laboratory engaged in innovative research, the CCT aims to develop content, artwork and services, support innovation processes, expand new knowledge transmission strategies for cultural expression, and communicate cultural knowledge to audiences across a range of age groups and cultures. The Centre for Indigenous Media Arts (CIMA) is mandated to work collaboratively with artists and communities to foster the contemporary artistic practice of Indigenous media artists. The Centre focuses on research/creation of scholarly projects at the confluence of contemporary art and indigenous culture exploring new forms of media and technology in contemporary indigenous art production. CIMA is located at UBC’s Okanagan campus in the Administration Building (ADM 044). The Research Studio for Spaces and Things (RSST) is an open platform for research and creation in the field of visual arts. The Studio is a transdisciplinary environment dedicated to the production and the presentation in 2D arts (drawing, painting, photography), 3D arts (installation, sculpture, design, architecture) and time-based practices (audio, video, performance). It will gather practitioners working across genres, disciplines and techniques. Contact: samuel.roy-bois@ubc.ca.